← Who will you become on the night of All Hallow’s Eve? I’m on a decoration kick! One of the things I miss about living at home was decorating for the holidays. We have so many Halloween decorations and as a kid I loved taking charge and making the decorating decisions! Opening those old basement cabinets and smelling the festive potpourri…I can still smell it! First off, is the Glitter Glam pumpkins! I knew this would be a great blog to look through even before my page fully loaded! Lauren’s mini bio posted to the right of her page reads: Won’t you grab a cup of chai, a comfy blanket, and stay a while? So Miss Lauren from The Thinking Closet (adorable name by the way, so creative!) 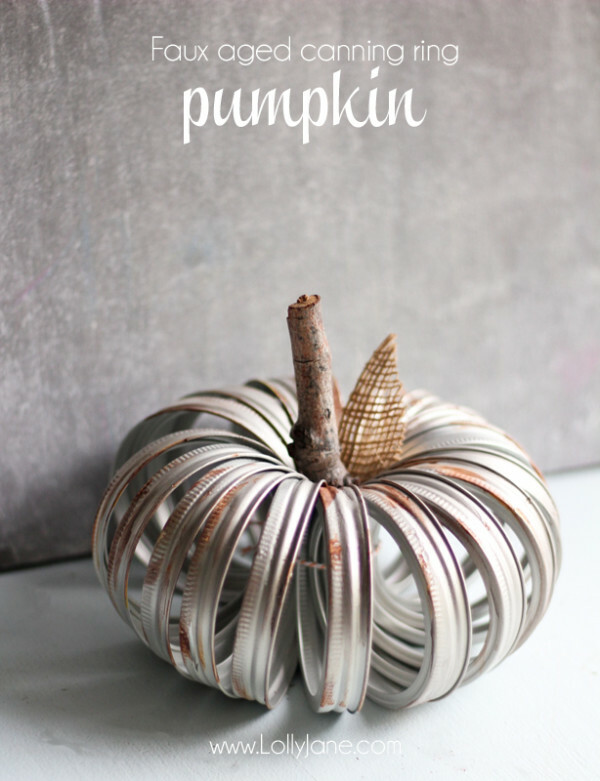 features her creativity and frugality in her post about pumpkin decor. 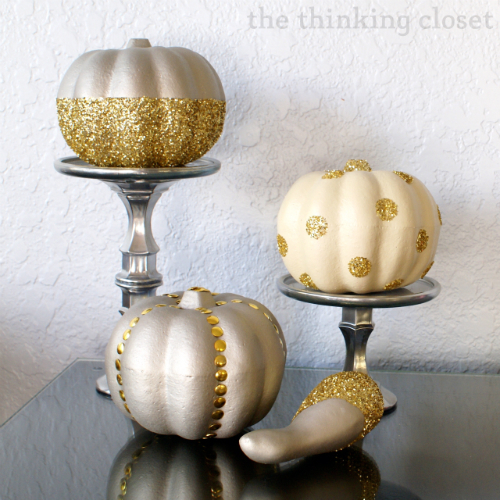 I LOVE those silver and gold glittery faux pumpkins! And what a deal. These decorated pumpkins add the perfect amount of glam without looking tacky! I’m sure my mom would love these for her fall centerpieces!—Christmas presents? Perhaps…. The aged canning ring pumpkin featured on Lolly Jane is also perfect for a dining room table centerpiece! I really want to make one of these. It’s just so glam and rustic! You should check out the blog Lolly Jane, and the creation of their name, so cute! I love the family background, and the use of old family names. It definitely makes thing unique and adds so much character! You are too kind! Thanks so much for the lovely write-up about my Glitter Glam pumpkins (I’m SO glad you’re a fan…and that you might make them as a gift for your Mom), and also I’m delighted to hear you enjoyed your visit to my blog. I always want everyone to feel welcome and at home…plus, chai lattes are my drink of choice, so it’s only natural to offer it up for my guests! 😉 Thanks again for this amazing feature…and I hope you have a wonderful Wednesday! Absolutely!! They’re so cute, and such a great idea!